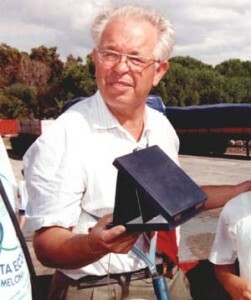 Mario Cervo was born in Olbia, he was the first of five children. His childhood spent in very hard times, both for the sad period of the war as well as be orphaned at a young age, he studied with profit until the third class devoting himself, with considerable sacrifice, to support the family. He began working in the Compagnia Portuale (the stevedores company) of Olbia and here strengthens its nonreligious, socialist and anti-fascist personality who will mark him throughout his life. In this period begins the phonographic material collection and the research in the field of all expressions of his native Sardinia. A research that began for his passion for Gavino De Lunas, memories of a childhood made ​​of gramophones that played in the streets and children who crowded in front of the “magic tool”, to listen to what Mario Cervo has always considered the king of cantadores. At the same time devoted his research to the recovery of everything that was published in Sardinia, or from Sardinian artists anywhere in the world, giving rise to a unique collection, suspended between traditional Sardinian music and light music. Is the year in which he got married to Anna Caboni, the woman who will stand beside him throughout his life. Nuraghe is established, is the first record in Sardinia. Mario join the birth of the first radios in Olbia conducting a transmission entirely in the Sardinian language. The use of Gallura and Logudorese languages become a hallmark of his public speeches, a sign of belonging to the people who still remember he for its simplicity, availability and generosity. In the 80s took part in the political city life by standing in the Socialist party, but disillusioned with politics, he prefers to devote his time to his passion for the culture of Sardinia and, as a manager of the Terranova Cycling Company, to the sport of cycling. He has turned his love for his homeland in a research of all that concerned it: records, cassettes, live tapes, compact disc. And also books, newspapers, magazines as well as music and prayers, songs, dances, voices and images. Over the years, many have benefited from his collection that represent the heart of countless researches on Sardinian folk music of 78 rpm records, on sing in the D and on the Rock in Sardinia. For all, from scholars to amateurs, there were news, information, disc to record or duplicate. The versatility of Mario Cervo and his archive ranges from Sardinian music of the twenties, to classical music, from Tenores to Jazz, folk music, pop music from the 60s to today. He was one of the founding members of S’Abboju, cultural association for the promotion of Sardinian culture by participating in various initiatives, among which highlights the construction of several meetings on the Scottis, dance extremely popular in Gallura. He was one of the components of the “council” for the use and diffusion of the dialect of Gallura. Mario Cervo, parallel to his interest in music, nourished a huge passion for cycling. He is one of the founders of the Terranova Company Society and has been the promoter of many events. It leaves us in the morning of eight October of 1997, but remains the memory of his talking objects, vinyl singer, a true cultural heritage that he wanted to leave a legacy to the city and to his Sardinia.